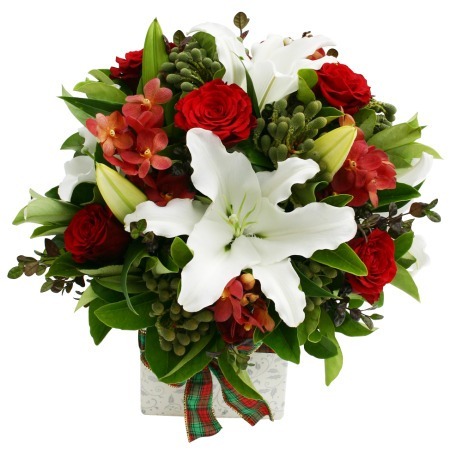 Spread a warm glow of Christmas cheer this year with our lavish arrangement of stunning flowers in red, green and white. Perfumed with the ever-popular white Casablanca lilies and dotted with rich red roses, orchid blooms and green berries, this impressive arrangement of flowers is presented in a white ceramic pot. Indulge this season and spread a warm glow onto your lucky recipient`s cheeks with a fresh flower delivery.